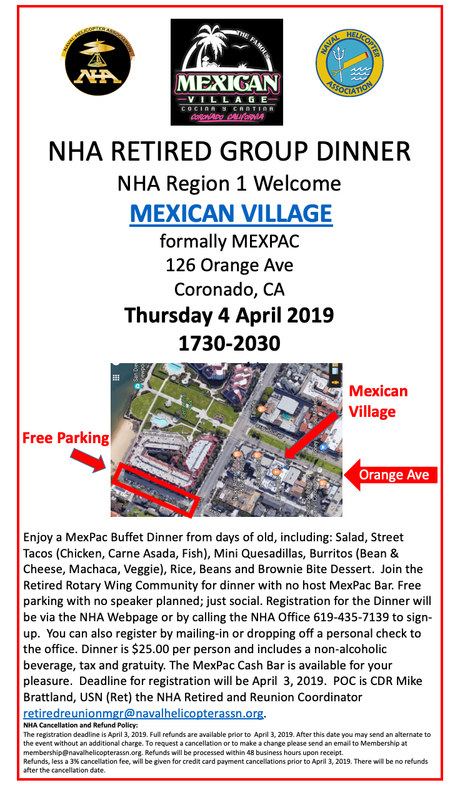 Join the Retired Rotary Wing Community for dinner with no host MexPacBar. Enjoy a MexPac Buffet Dinner from days of old, including: Caesar Salad, Street Tacos (Chicken, Carne Asada, Fish), Mini Quesadillas, Burritos (Bean & Cheese, Machaca, Veggie), Rice, Beans and Brownie Bite Dessert. Free parking with no speaker planned; just social. Registration for the Dinner will be via the NHA Webpage or by calling the NHA Office 619-435-7139 to sign-up. You can also register by mailing-in or dropping off a personal check to the office. Dinner is $25.00 per person and includes a non-alcoholic beverage, tax and gratuity. The MexPac Cash Bar is available for your pleasure. Deadline for registration will be April 3, 2019. POC is CDR Mike Brattland, USN (Ret) the NHA Retired and Reunion Coordinator [email protected].